[Fandom & Personal Post] Games, Medical, Housekeeping, BIRTHDAY! Games: I’m still fully in Final Fantasy XV hell, and I don’t see myself coming out of it any time soon. The Chocobo-Moogle Carnival/January Update came out this past week, and while I do have some pictures of #PrinceSpaceMan‘s adventure through the festival I’m still working on how I want pictures formatted here. I need to find out if I can link external images into a “gallery” format post or if I have to host them locally. If it has to be local, well, we’ve got some problems. More on that later, though. I’ve also gotten kind of hooked on Final Fantasy Record Keeper, something I don’t know how I haven’t played before now. I’ve even downloaded it multiple times in the past, and when I never got around to it I would uninstall it again. It’s so much fun though, and so cute. Twitch streaming of FFXV will pick up again when I get my PrinceSpaceMan NG+ caught up to where the original save’s streams left off. I think that’s chapter 6, but I’m not sure. I need to dig through my previous clips and figure out where I was. It won’t have the fun of first-time reactions that the original save had, but at least I won’t be wandering quite so blindly. Medical: If you follow me on Twitter, then you know that this week especially I’ve been going through some of the worst migraines I’ve had in years. They’re getting in the way of a lot of things right now, and I’m trying to push through them, but damn it’s been hard. They’ve been cutting into everything, both Serious Life Stuff and Fun Relaxing Stuff. So when I have the energy, I might be whining about that a bit. If I’m not whining, I’m either sleeping or feel well enough to watch movies or play games or something. Housekeeping: Like I said above, I’m still working out some kinks of how I want to make gallery posts here. Storage on my free account is… lacking… but I’m not in a spot to upgrade that right now. So, if gallery images have to be hosted locally? That’s a problem. But if I can link them from anywhere else we’ll definitely be in business. Maybe it’ll let me host thumbnails and link those to full sized images off-site? That might be a happy medium, if necessary and allowed. BIRTHDAY! The countdown is less than a week now, and my manager gave me a 4-day weekend for it. (I was only asking for the day itself because the month-end/month-start transition is so busy, but she says she can cover it.) They aren’t free days off, of course, but my allowed time off can afford it, even with being sick this week. More importantly than birthday, though, is Cake Day. Yeah, I capitalized that. It’s an event. I told Brian to tell anyone he invites over for that the cake is all I’m worried about, and to just bring games to play and not other stuff. I have enough things that I can’t keep up with as it is. I’m still trying to figure out what to ask for for my cake, though. I normally have this decided months in advance for something mildly ridiculous, but this month all I can really think of are stars or the color purple. 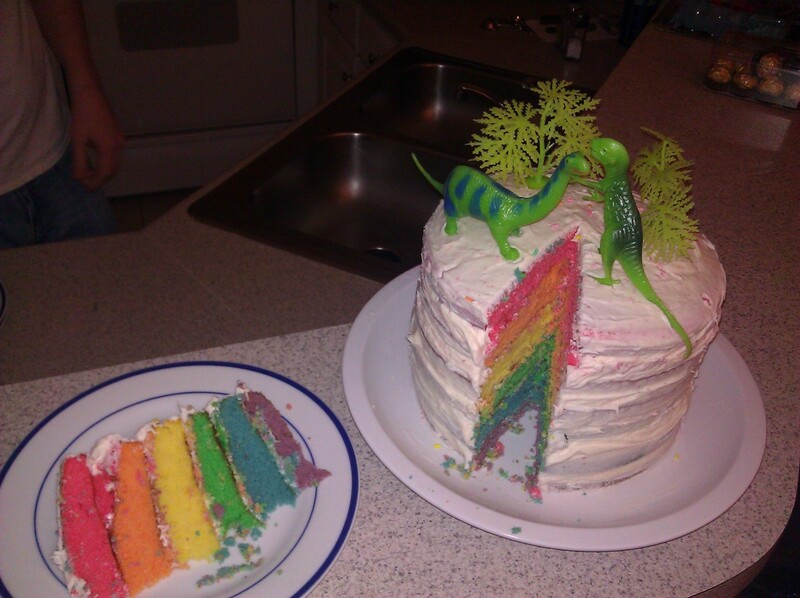 A far cry from the rainbow dinosaur cake from a few years ago, but I’m cutting it really close time-wise so I’ll take what I can get.